The nave and western chancel are early to mid-C12, with mostly later windows. The late C12 tower has been altered, including the addition of heavy buttresses and a possible reduction in height. 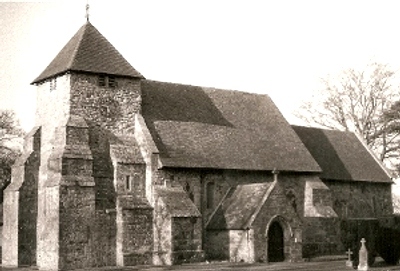 The chancel was lengthened in the C13 and the north aisle was added in 1861. The nave and chancel are early C12, as two high round-headed south nave windows show, though they have been enlarged. The square lower north respond of the present entrance from the nave to the tower survives from what was originally the west doorway. In the western chancel, there are more original windows both sides and the jambs of a south doorway, which was replaced by a C13 lowside. 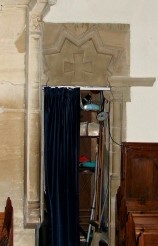 The chancel arch is contemporary, with a roll-moulded outer order on the head and responds with angle-shafts and foliage capitals. The latter provide corroboration for the date, as such foliage carving is found shortly after 1100 (www.crsbi.ac.uk). The continuations of the abaci across the wall look C19, but probably follow an original feature. In the late C12 a west tower was added, originally unbuttressed, which is now no higher than the nave. The detail is later, except possibly the double bell-openings, which seem decapitated by the heavy pyramid spire. 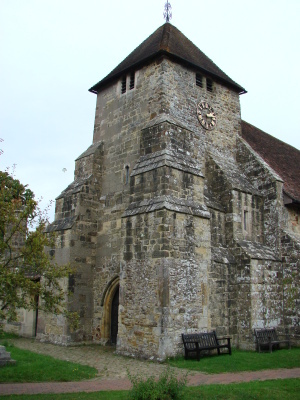 It is conceivable that the tower was shortened, possibly during early C17 alterations (see below), as may also have happened at Lancing, West Sussex. A west lancet seen in the second of two Sharpe Collection drawings (1807) has gone. Inside the tower is a substantial bellframe on four posts, which is certainly no later than the early C17 and could well belong to the original structure. The extension of the chancel in the C13 is marked by a visible join on the north side (that on the south side is hidden by a buttress). 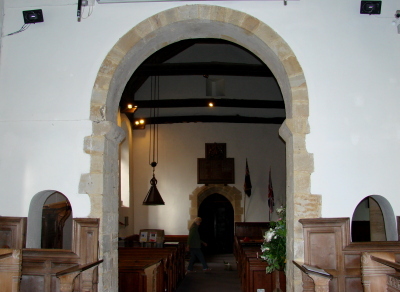 The side-openings of the chancel arch, though round-headed, probably date from this time, as they are angled towards the present position of the altar. Both the old and the new parts have small side-lancets and the lowside already noted. Some plain roof-timbers could be C13. The present three stepped east lancets are C19 but may follow the previous form. Also in the C13, stepped clasping buttresses were added to the tower, the earliest evidence of structural problems. A C14 doorway with curling stops was fitted between the buttresses of the tower and the sides were further buttressed (to the south a stair was built in). The ashlar at the north west angle contrasts with the C13 rubble masonry and this corner may have been rebuilt at this time. A two-light south nave window with a quatrefoil in the head and more curling stops is also C14, like the plain south doorway and the segment-headed south doorway of the chancel. The 1807 Sharpe drawing shows a C15 square-headed window near the west end (the present one has ogee-quatrefoil tracery), which may be the ‘rectilinear’ one Sir Stephen Glynne saw (SNQ 18 (Nov 1968) p41). The moulded nave roof timbers are also C15. Almost certainly in the early C17 heavy buttresses were added at both ends of the nave and against the sides of the chancel (the western one is dated 1624). The lower parts of the buttresses against the south side of the tower were joined, hiding the C12 walling behind, and any reduction in height seems most likely then. The enlargement of the C12 windows of the nave may have been done at the same time. A sundial on the south porch is dated 1626, though said (Church guide) not to be in its original position, and this supports the early C17 date for the work as a whole. Though some of these buttresses, especially that on the south side of the chancel, were altered in the C19, they were kept for structural reasons. There was considerable work during that century, starting with an abortive proposal to extend the church in 1836 (ICBS). Unusually for the date, one of the options was to replace the chancel by a larger one. 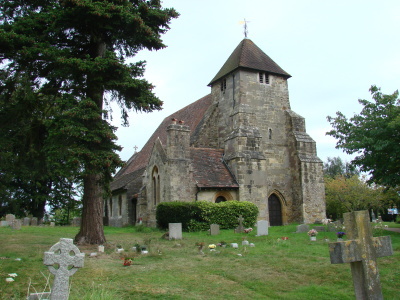 A more conventional restoration started in 1860-61 with the nave and tower and the addition of a north aisle. Again, unusually for the date, the aisle and arcade are neo-Norman with an extraordinary west doorway inside with a head like a star. The architect was C E Davis (BN 7 p613), with J Clarke in an apparently advisory capacity. According to PP125, less than £900 had been spent by 1875 and though the only existing feature to be replaced entirely was the south west window, the sum is likely to be under-estimated. Sir A Webb restored the chancel in 1889 (CDK 1888 pt 2 p139), replacing much of the roof and rebuilding or refacing the east wall with three lancets, though the east window then contained glass of 1883 (see below), suggesting there had been earlier work to the chancel. Webb also replaced a smaller vestry north of the tower by Davis. His replacement has a gable at right-angles to the church and a conspicuous chimney. Fortunately, he kept Davis’s doorway from the aisle. Most of the east wall was also rebuilt but even so, the cost of £8000, as stated in KD 1899, seems by contrast a probable over-estimate. In the C20, there were repairs by C E Callow in 1963-64 and by D M Hollis of The Stevens Partnership in 1979 (both ICBS). Commandments etc: (Now in north aisle) Painted boards bearing the Ten Commandments and the Lord’s Prayer. They appear to have been repainted recently, but are probably C18 in origin. Door: (South) Dated 1542 in iron numbers. Font cover: C17 and conical in form. 1. (North east chancel) Langdon suggests (p165) that the greenish clear glass may be C13, but this seems doubtful. 2. (East lancets) Glass by A Booker of London, 1883 (St John and other saints) is no longer there. 3. (North aisle, circular east window) Whall and Whall (i e V Whall), c1933 (DSGW 1949). 4. (Nave, south east window) A Wright, Millennium window with symbolic glass, c2000 (Artist’s website). Painting: (Chancel roof) C19 and probably dating from 1889. 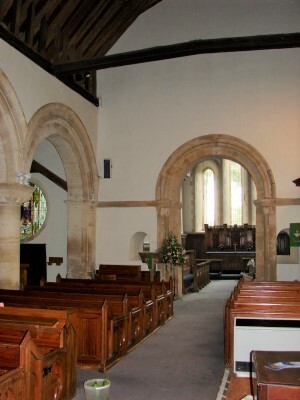 Pews: Though C19 and quite low, these have the conservative feature of individual doors. Pulpit: Made up at a later date from early C17 arcaded panels, perhaps from pew ends, and a large sounding board with inlaid decoration which is C18. Recess: (East wall of chancel) Probably for relics and C13, though round-headed. Reredos and other chancel fittings: Carved wood, designed by W D Caröe, 1933-35 (Freeman p251). Royal Arms: (Above entrance to tower) Painted panel dating from the 1950s. Stoup: (By south doorway) Mutilated and probably C14.